Paint Store :: Shop by Brand :: Modern Masters :: MODERN MASTERS 20801 ME208 IRON REACTIVE METALLIC PAINT SIZE:1 GALLON. 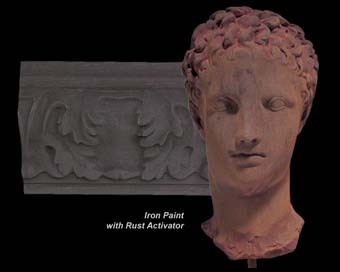 MODERN MASTERS 20801 ME208 IRON REACTIVE METALLIC PAINT SIZE:1 GALLON. Metal Effects® Reactive Metallic Paints are water base and contain real metal particles. These paints will tarnish naturally over time and when exposed to the elements. ABSOLUTE COATINGS 70014 POLYCARE MICROFIBER PAD. WATCO 63041 LACQUER CLEAR WOOD FINISH GLOSS SIZE:QUART. RUSTOLEUM 249855 SPRAY SATIN STONE GRAY PAINTERS TOUCH 2X ULTRA COVER SIZE:12 OZ. SPRAY PACK:6 PCS. DAP 12276 ELASTOPATCH SMOOTH FLEXIBLE PATCHING COMPOUND (RTU) WHITE SIZE:10 OZ PACK:12 PCS.